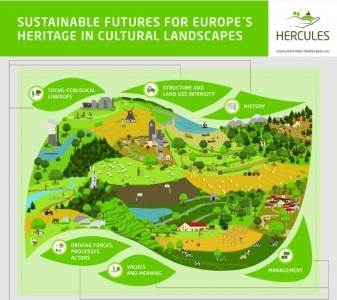 The aim was to have a WP that would form the conceptual and theoretical backbone of the project that would take stock of existing knowledge on drivers, patterns and outcomes of persistence and change in Europe’s cultural landscapes. Its objectives were (a) to define core concepts around cultural landscapes and set-up a comprehensive and interdisciplinary framework to ensure consistency within the project; (b) to search the scientific literature to identify and quantify drivers, patterns and outcomes of persistence and change in landscapes; (c) to identify the actors responsible for and impacted by cultural landscape change and (d) to synthesize archetypical combinations of drivers and outcomes of landscape dynamics at multiple spatial scales. These sound ambitious and were largely achieved, although the last part (the synthesis) is still in the final stages of completion. There are some “Deliverables” that… well delivered the results officially, but most of the work has already been published in scientific journals as well. The framework for cultural landscapes was published in 2015 (1); the meta-analysis on drivers of landscape change in 2016 (2) and the research on actors of landscape initiatives also in 2016 (3). What has not been published and is of value is a “dictionary of terms” on cultural landscapes (that was part of D1.1 and will be made available on the website of the project) and the meta-analysis on rates of landscape change. Two more papers are under preparation for the synthesis part due in November 2016 and part of the final Deliverable D1.4. But this is not all! 15 more papers have been published as a partial result of HERCULES WP1 activities (you can see a list below), which makes us particularly proud. 8. Raymond, C.M., Kenter, J.O., Plieninger, T., Turner, N. J. and Alexander, K.A. (2014) Comparing instrumental and deliberative paradigms underpinning the assessment of social values for cultural ecosystem services, Ecological Economics, 107, 2014: 145-156.